In a graduate seminar at Yale many years ago, two of my classmates balked at reading Augustine’s “Confessions.” One declared that he could not read the text as a detached scholar because every sentence spoke to the very existential questions with which he himself was grappling. The other declared that anyone who, as an adult, obsessed about his childhood theft of fruit from a neighbor’s orchard was a neurotic whose ravings were not worth reading. Both men dropped out, the first to enroll in Harvard Law, the second to divorce his wife and join a gay commune. The 1970s were a strange decade. 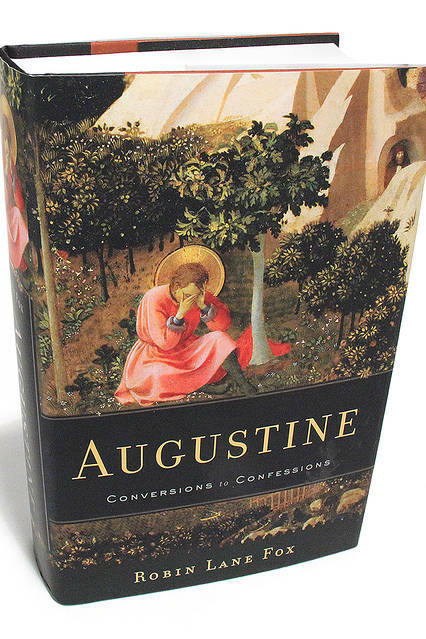 But the question remains whether, in our secular age, Augustine’s “Confessions,” an extended prayer addressed not to the readers but to God, can continue to reflect the human condition or whether it must be understood simply as a document of a late fourth-century Roman provincial. In taking on the challenge of a biography of Augustine from his birth in 354 through his composition of the “Confessions” in 397, Robin Lane Fox, the distinguished Oxford classicist, faces a daunting task: To write something fresh about this foundational figure in Christian thought, something that could add to Peter Brown’s classic “ Augustine of Hippo” and James O’Donnell’s compelling “Augustine: A New Biography.” He does so by framing Augustine between two contemporaries. The first figure, Libanius (314-93), was older than Augustine, a traditional pagan and admirer of the Emperor Julian (the “Apostate”). Like Augustine, he was a professional rhetorician. The second, Synesius (373-414), was a bit younger than Augustine and hailed from a wealthy Greek family from what is today Libya. Although a Christian, he was a pupil, in his youth, of the great Neoplatonist female philosopher Hypatia in Alexandria, and he remained throughout his life devoted to philosophy as well as to the life of a married aristocrat (even after his election to the episcopacy). He wrote poetry, hunted in the Libyan desert and led troops against barbarian raiders in North Africa. By contrasting Augustine’s options, choices and career with those of these two men, Mr. Fox makes all of them more comprehensible. Augustine’s family background, for instance, was mediocre, as was his patronage network, when compared with those of Libanius and especially Synesius. His rhetorical education had been in Latin, not in the more intellectually respectable Greek, which Libanus mastered. The young Augustine was fascinated by Cicero, whom he venerated as the great Roman orator but even more for his exhortation to the pursuit of wisdom, a pursuit that never interested Libanius. Augustine’s own search for wisdom led him initially to embrace Manichaeism, a dualist religion that combined and sought to complete elements of Buddhism, Zoroastrianism and Christianity. Later in Italy he discovered Neoplatonism, which provided him with a powerful philosophical tradition through which to interpret Christian teachings, to which he was increasingly drawn. Augustine’s struggles against his own sexual desires culminated in his dramatic conversion, followed by the creation of a commune of like-minded Christians. Mr. Fox goes on to treat his subject’s return to Africa, his ordination, polemics and eventual elevation to the episcopacy. Though he touches on many familiar aspects of Augustine’s life, he is especially insightful on Manichaeaism, a world religion that continued to influence the structure of Augustine’s thought. Thus the final chapters of his “Confessions,” rather than continuing the story of his spiritual journey, become a commentary on the book of Genesis, and implicitly a refutation of the Manichaean cosmology. Mr. Fox traces with clarity the development of Augustine’s thought, but also of his character, his deep relationship with his mother, Monica, and his engagement with his network of friends, patrons and intellectual adversaries such as the Manichaean priest Fortunatus with whom he held a public debate in August of 392. The discussions of Augustine’s early dialogues and letters do not always make for light reading, but they are always worth the effort. Mr. Geary is a professor at the Institute for Advanced Study.